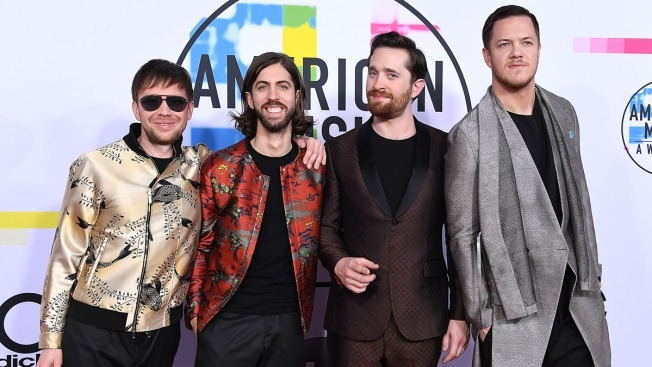 (L-R) Ben McKee, Daniel Wayne Sermon, Daniel Platzman and Dan Reynolds of Imagine Dragons arrives at the 2017 American Music Awards at Microsoft Theater on November 19, 2017 in Los Angeles, California. Imagine Dragons and The Killers will pay tribute to the victims of the deadliest mass shooting in modern U.S. history when they headline a concert Friday in Las Vegas, the city that saw them rise to stardom. For Image Dragons frontman Dan Reynolds, the concert is about helping his hometown recover from the tragedy. With world-famous casinos, nightly shows and more, visitors not always venture away from Las Vegas Boulevard, but Reynold said, there is "a real thick community and culture here of people." "This concert is representative of a community that is coming together to heal, that is going to continue to go out to concerts and shows and not let one individual and his reckless and just senseless behavior stop people gathering and enjoying life and entertainment," Reynolds, who resides in Las Vegas, told The Associated Press this week. "This is the city of entertainment." Imagine Dragons band members learned about the shooting after wrapping up a show in Los Angeles. Reynolds said one of his best friends was bartending at the music festival and escaped uninjured, but was "devastated" after witnessing people around him getting shot. "It hits really close to home in a lot of ways," Reynolds said. Concert tickets, which range in price from $75 - $125, are still available. Proceeds from the concert will go to the Las Vegas Victims' Fund, which has collected about $11.5 million since it was created shortly after the shooting. Under a proposed plan, the money would be distributed to relatives of the people killed and to those who were hospitalized. "For us, Las Vegas is a vital part of who we are as a band and who we are as human beings," The Killers, which was formed in Las Vegas, in a statement. "Please join us as we do what we do best in honor of those who lost their lives and celebrate the heart and humanity that keeps us united."